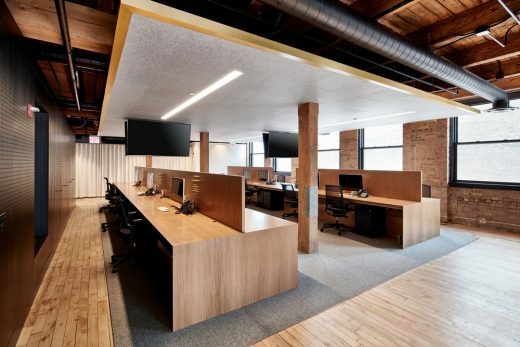 GROWING UP: This is the next generation, Chicago workspace for Ansarada, the fast growing M&A financial data services company. 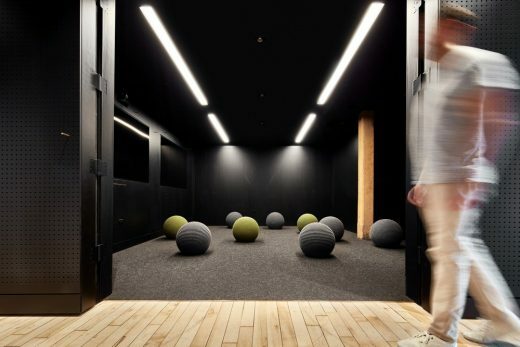 Perhaps the last thing you would expect to encounter on entering a financial services workspace is a luxurious ‘collaboration room’ with woollen sphere seats, more akin to a fine art installation than a meeting room. 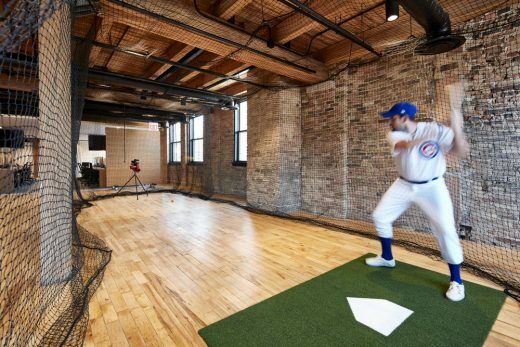 Certainly not then, a full scale baseball batting cage complete with pitching machine – a nod to the projects location in Chicago, Illinois, USA. Both are part of a sophisticated new office fit-out for the Sydney based global financial services company with which THOSE Architects have a long standing relationship, having delivered their multi award winning and widely published headquarters in Sydney, Australia. “We deal in a virtual, data-driven world but our most valuable asset is the people behind the scenes”, says Ansarada CEO Sam Riley. 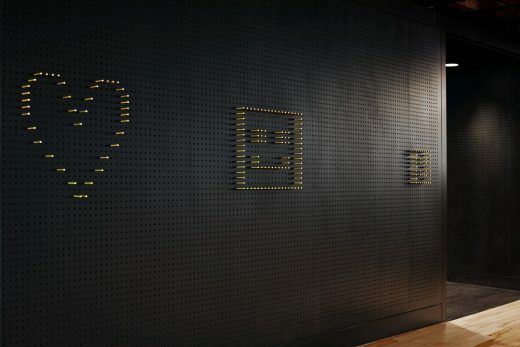 “We aim to simplify, not complicate, not just in our product interface but for our clients, and the way we work as a team. So we wanted our office to be a truly wonderful space. Serious and at the same time, playful, simple and sophisticated, fresh yet experienced, authentic and contemporary. Our workplace should reflect these values, and make a positive difference to our lives, and to our clients lives. 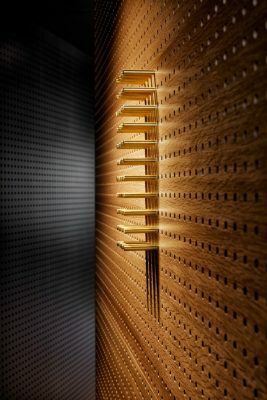 THOSE Architects fit-out does all of those things for us”. 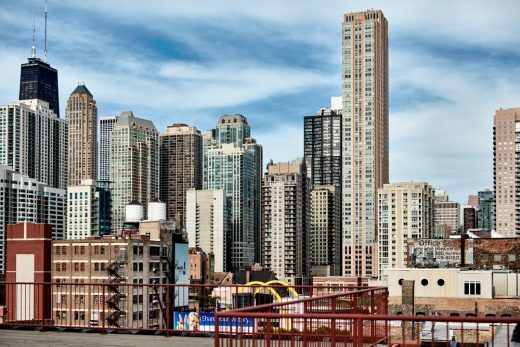 The 880 sqm (9500 sqft) project is located in Chicago’s river north district, a stylish urban neighbourhood bordering the magnificent mile. 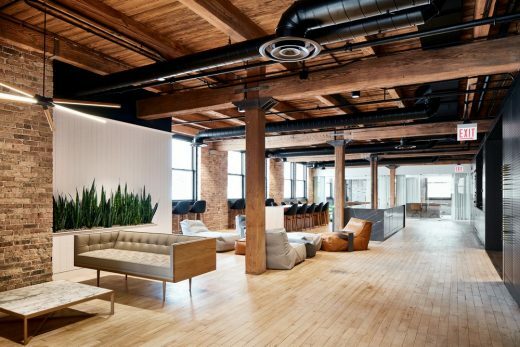 The office occupies the entire fifth floor of a grand old warehouse richly textured with hand pressed bricks, douglas fir posts and beams, finely detailed windows and hardwood floors and ceilings. 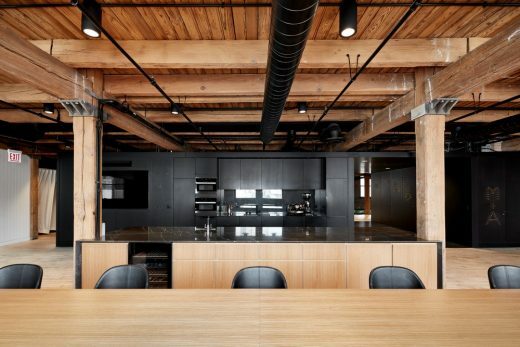 As the building was not heritage listed by the City of Chicago, nor the state of Illinois, THOSE Architects were able to take a more aggressive architectural approach to the fit-out than was possible in the heritage-sensitive Sydney project. “While remaining respectful to the grand old lady we inherited, we were able to insert some substantial architectural elements into the space to enable us to better establish functional zones throughout this project” says THOSE Architects director Ben Mitchell. 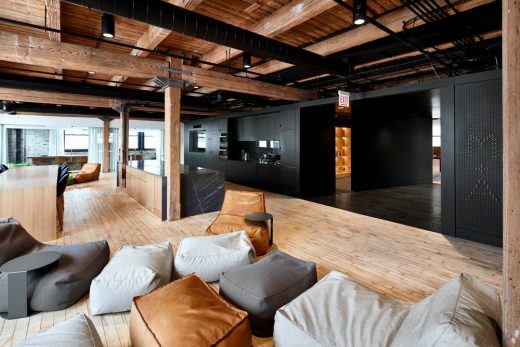 The Chicago space functions primarily as a marketing, sales and client services office which to a large extent dictated the performance brief to THOSE Architects. “It is a simple concept, but we had to ensure the space functioned acoustically and aesthetically to reflect the brand’s mantra of sophisticated simplicity while seamlessly integrating a great deal of technological infrastructure to allow the staff to perform at their best”. Ben says. 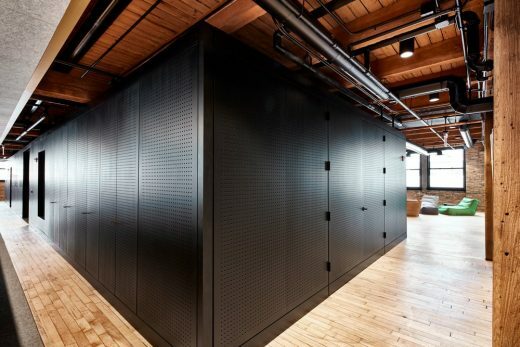 The project’s main move was to insert a bold black plywood box down the centre of the space in order to clearly define the three zones of the office. The main utility functions are carried out in this zone with provision of a kitchen, mud room, shower room, laundry and storage facilities. 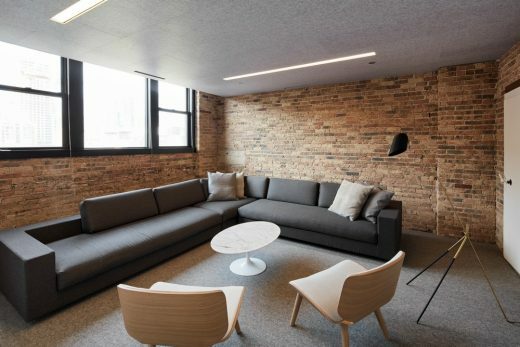 Also covertly located in this architectural element are a collaboration space and reading room, both of which gain considerable acoustic and visual privacy as a result of this location. 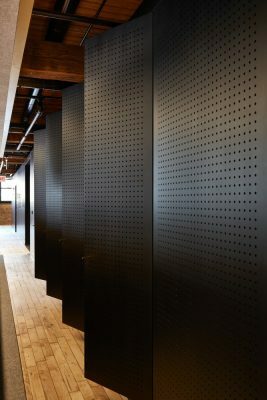 Not only does the central black plywood box provide the main architectural element in the space, it is detailed with hundreds of thousands of peg holes that enable the staff to utilise the entire surface in myriad of ways. 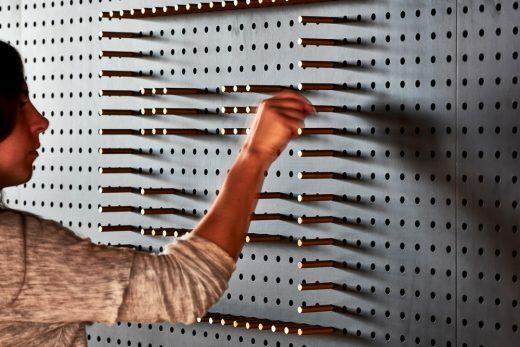 Brushed solid brass pegs sleeve perfectly into the peg holes and are used for anything from writing your colleague a message to hanging a coat. 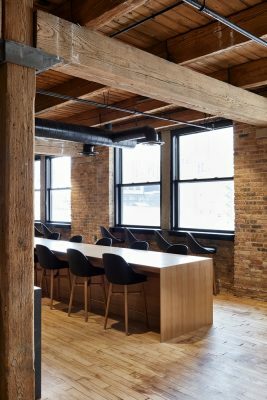 The recreation and informal meeting rooms are located kitchen-side of the black box with a jaw dropping view over the Chicago skyline. This zone features the entry reception complete with custom detailed couches and light fixture, staff breakout area featuring custom soft furnishings, dining zone, gaming area and ultra refined meeting rooms. 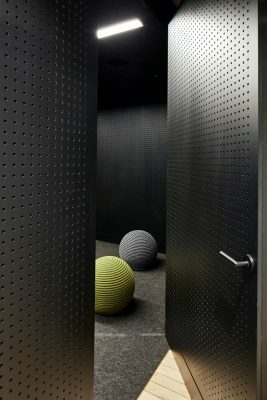 Far-side of the black box, the workstations are accommodated and feature soft grey woollen carpets and ceiling panels with intricate brass and timber detailing. 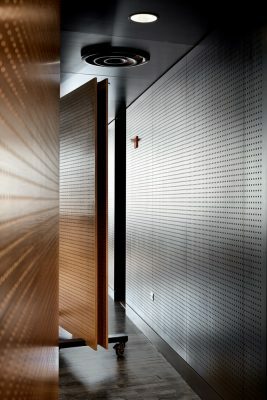 Secret doors abound throughout the space, concealing everything from storage to a full scale library. 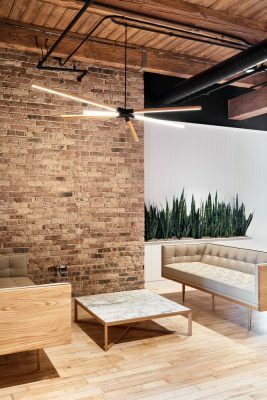 Four years on from the inaugural Sydney fit-out, Ansarada has matured as a company which is reflected in the architecture of the Chicago project. 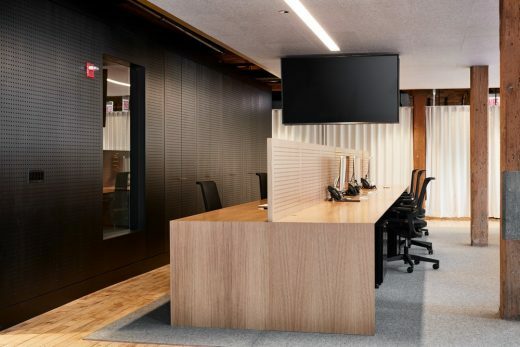 THOSE Architects have retained the playful essence of the Australian philosophy, however have imbued this project with a layer of sophistication rarely seen in the corporate workplace.